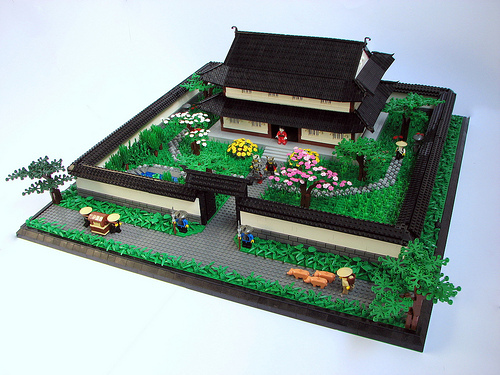 Stefan Käsmayer (-2×4-) captures the essence of a samurai house, complete with a well-tended garden and secure wall. I’m especially impressed with details like the slatted windows and stone base of the wall. Nice! I really enjoy these oriental style builds. And it instantly reminds me of the ‘Tracking Hayamoto’ mission from the computer game Hitman 2.